I know that some parents think that speaker points represent a “grade” in debate skills, but it doesn’t. Speaker points on the Ballot have nothing to do with either you win or lose, as they are two separate categories. 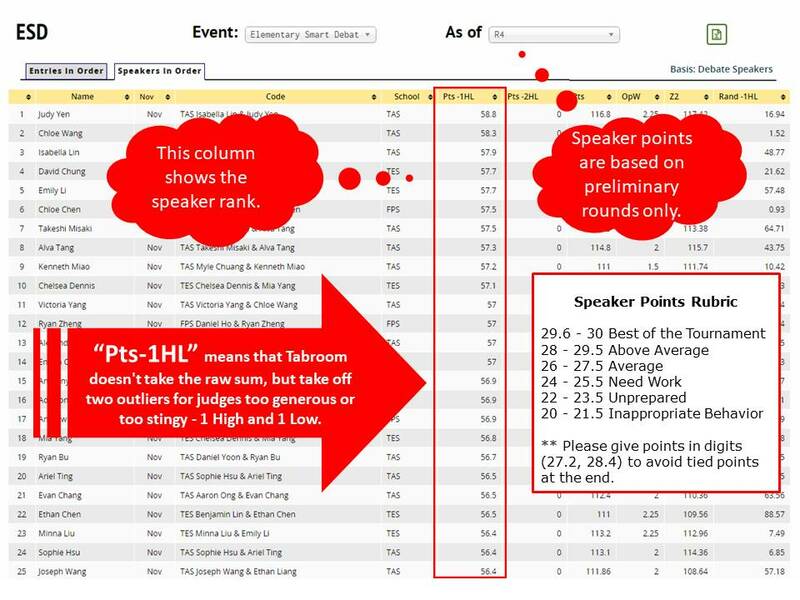 Speaker points are only used as a tiebreaker. Ultimately, we would like our child to do both well – delivery (mouth) and strategy (brain); so, if your child is already good in delivery, then one less worry for you. Each judge is different; some are stingy and some are generous with points. For example, stingy judges might give students points ranging from 18 – 25, while generous judges give points ranging from 25-30. Therefore, unlucky students who get stingy judges will have nearly impossible chance of winning speaker awards. For example, in 2017 December China NSDA Kevin was #1, Kelly #4, but after only two months, in 2018 February China TOC, they didn’t even make it to the top 25 speakers. Instead, Yvette and Ethan made it to top 25 list. The fact that both debaters from the same team were awarded in year 2017 (both Kelly & Kevin) and 2018 (both Yvette & Ethan) shows that most likely Kelly/Kevin had luck with generous judges in 2017, but the luck was not with them two months later, and vice versa for Yvette/Ethan. Because speaker points doesn’t represent your debate skills, but your vocal delivery, a student with a loud, clear, high-pitched voice will often receive higher speaker points. However, because parents believe what they see and hear rather than what is behind the scene such as “winning strategy” that actually renders a “winning vote,” too frequently misconceive the louder speaker as a better debater. This is not only true with the parents, but even with many “lay” judges common in PF and WSD debates. Non-expert judges hired in PF and WSD too frequently focus more in speech style than the argumentation, and thus vote for the louder team because they don’t understand the arguments enough; however, this phenomena happens less frequently with policy debate. By the same logic, judges tend to give your high-pitched female partner higher speaker points as opposed to the male partner with a lower, deeper voice. For example, in 2017 China NSDA Changxia , I thought for sure Brent who was the Novice Champion would also win a speaker award because he enunciates with clear, loud voice, and almost never stutters, but his sister Yasmin with a voice that is higher and more pleasant won the speaker award, not Brent, who even his sister Yasmin and the team’s mom admitted was a better debater. Judges usually give more speaker points to the second speaker because second speaker does the rebuttal, the fighting in the debate, the most cogent and persuasive arguments in the round in order to win. In addition, the second speaker delivers the last speech in debate, which affects the judging the most. Judges also give lower speaker points to debaters who speak too slow, speak too fast, stutter, or silent. For example, my son Brandon, Kelly, Allen, Kevin, and other policy debaters who had years of debate experience are so advanced that they usually speak too fast in rounds (called spreading in policy debate); therefore, they had a hard time suddenly adjusting to the slower PF style of debate in 2016 Korea NSDA. As a result, they received lower speaker points compared to some of the novice, female, high-pitched speakers like Yasmin and Kristina who spoke slower. Judges also give lower speaker points to overly aggressive or rude debaters. U.S. Style debate encourages civility by awarding polite debaters with higher speaker points. I hope you finally comprehend this difference, and understand that winning is more important in debate as opposed to speaker points, as speaker points often fluctuate too wildly on luck (what kind of judges you get), or the voice type (high/low, male/female), proving that it really has nothing to do with your child’s mental ability. In fact, NSDA does not give NSDA points to students with high speaker points; rather, it gives NSDA points to students who not only win debate (4 points each round), but even lose (2 points each round). Also, for every debate tournament, awards for top speakers are always smaller compared to debate team awards, which clearly symbolizes the order of importance and significance in the debate world. For so long as your child is learning and improving, your child is winning, even if s/he never wins in the tournament. Remember why your child is learning to debate: 1) because everything in life comes down to one’s ability to communicate; 2) debate is the highest stimulant for brain and best food for critical thinking; 3) debate students become most distinguished leaders of the world; 4) the new SAT was designed by a former debate champion, David Coleman, and requires debate skills more than ever; and 5) critical thinking is the skill set necessary to survive or thrive in the U.S. universities and in their future job-settings.